In June of 2013 I was a student in a Master of Social Work program at Portland State University and took advantage of an opportunity to study in Ghana. Being a woman in recovery thoughts started to enter my mind that I might be able to try palm wine and akpeteshie and no one would know. I could probably get away with one taste, right?? Because my recovery is the most important thing in my life I sighed heavily and called my academic advisor about a placement in treatment and recovery. I didn’t know how profoundly this decision would influence my life. As a result of my request I was connected to Dan O’Laughlin who provided me with the opportunity to spend two months working at the House of St. Francis. My eyes were open to a new level of service work. The men and women that I worked with, in recovery and “normies”, gave of themselves freely and were devoted to bringing greater recovery access to Ghana. I cannot express the inspiration I got from these incredibly selfless individuals. I returned to Ghana in the summer of 2014 spending two more months at the HSF. 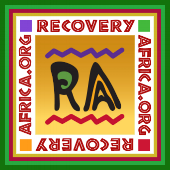 I could go on at length about my experience in Ghana, both inside and outside of the recovery movement. Since my space here is limited I invite you to read more about my experience at: stigallshelia.blogspot.com. I am so grateful to have met so many remarkable people and for the opportunity to contribute, in my small way, to this incredible organization. I sincerely hope I will be able to return to Ghana someday.